An excellent short trek in the High Atlas to the summit of Jebel Toubkal. Small company giving personal service. Beautiful and varied scenery, just what we wanted. Excellent experience for the experienced walker. The climb is on scree and boulders throughout, with beautiful exceptions in the villages, the lake and running streams. The standard of food on trek was fantastic and beyond that experienced on other treks undertaken. Hussain, our guide was adaptable and knowledgeable and we could not have wished for better. How can somewhere so close to Western Europe be so different? From the moment you awake to the sound of the call to prayer, the history, art, culture, religion and way of life the Kingdom of Morocco beguiles you, long after you’ve arrived back home. The diverse landscapes too offer a feast for the traveller boasting high mountains, deep gorges, rugged coastline, fertile river valleys and the sweeping sands of the Sahara. At 4,167m/13,671ft high, Jebel Toubkal is the main, but by no means the only, objective on this great new shorter trekking holiday. Whilst some may be content just to try to bag North Africa’s highest peak in two or three days, our itinerary offers careful acclimatisation and immerses you in the land of the Berbers. Leaving Marrakesh, you make a short drive to Oukaimden in the heart of the High Atlas to begin your trek to the Toubkal Massif. Your trek will take you through isolated valleys, crossing high passes and camping in high pastures or by rushing streams. After warming up with a trek around the eastern and southern flanks of the Jebel Toubkal, it’s a straightforward climb to the summit, which rewards you with views over the High and Middle Atlas and occasionally the Sahara beyond. Finally you return to Marrakesh with time to experience the sights and sounds of this most atmospheric of cities. We can also offer a private departure of the Mount Toubkal Ascent trek for a minimum of two people sharing. Prices start from £635 per person. International flights available from £250. Contact the office for further details or to book your private departure. Meal arrangements: Bed and Breakfast in Marrakesh. Full board whilst on trek. Fly to Marrakesh. Transfer to overnight riad. Drive to Oukaimden. Trek to Assaro. Trek to Azib Imi N’ouassif. Ascent of Jebel Toubkal, 4,167m/13,671ft. Trek from Refuge to Imlil. Drive to Marrakesh. Fly to London. The trip will be led by a qualified Berber guide who is ideally placed to give you an insight into and information about their country, especially as much of this tour runs through the Berber, or Tachelhit speaking parts of Morocco. 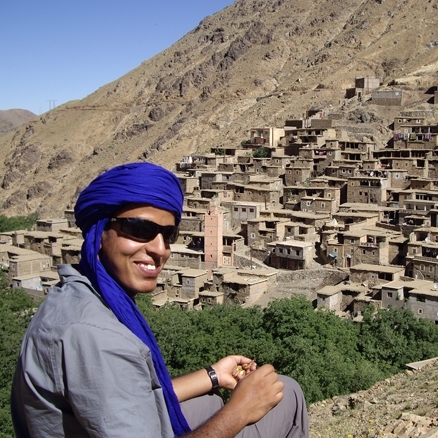 The Moroccan government closely controls the appointment of both mountain and town guides. Your guide will have completed a year of training at the Centre for Mountain Guides in Tabant in the Central High Atlas. During their training, guides complete courses in First aid, Geography, History and the Natural science of Morocco as well as testing their fitness. Our Moroccan leaders are selected on the basis of their experience, levels of spoken English and helpfulness. Like the Berber culture from which they come they are all very welcoming and have a love of showing you their country. Day 1 - Fly London to Marrakesh. Group transfer to hotel. Marrakesh airport is only 7km from the old city centre and it's therefore just a short transfer to your overnight hotel. Day 2 - Drive to Oukaimden, 2,600m/8,530ft - 1-1½ hours. Trek to Assaro, 2,314m/7,592ft - 4½ hours. Your trekking guide will meet you this morning and together you will make the 1-1½ hour drive to the trailhead near the village of Oukaimden. You will meet your muleteers here and when all of your kit bags and the camping equipment have been loaded up, you set off on trek, contouring round the grassy valley of Assif-a-Ait Irene. Your first objective of the trek is the Tizi-nou Addi (2,957m/9,702ft). Tizi is the local name for a col or mountain pass and you will climb to cross a number of these on your trek to reach Toubkal. From the Tizi there is a steep descent through rocky terrain to reach the Berber village of Tacheddirt. You'll camp outside the village at Assaro. Today's trek typically takes around 4½ hours and involves approximately 360m/1,181ft of ascent. Day 3 - Trek to Azib N’Ououraine, 2,900m/9,515ft - 6 hours. After breakfast, you leave the Imenane valley and begin the long climb up to cross Tizi-n-Likemt at 3,350m/10,991ft. Although less frequented than yesterday's trail, the path is well graded and clear, passing initially through scrub and then a barren rocky landscape to reach the col after about 4 hours. Views from the col are impressive and from here your guide will be able to point out the route for subsequent days. Lunch is usually taken before beginning the long 800m/2,624ft descent to the valley floor below at Azib Likemt, 2,550m/8,367ft, an area of summer pastures for Berbers living lower down the mountains. You now make the last ascent of the day, crossing then walking alongside a pleasant stream. There are rock pools along the way and on a hot day these may tempt you into a discreet dip! The small pasture of Azib n'Ououraine where you will camp tonight appears suddenly. There is plenty of space and some pleasant grassy patches, though they are grassy because they are permanently damp (be warned). A short distance up the path through the scree beyond takes you to the pass you will cross tomorrow. You are now quite high 2,900m/9,515ft and it can be cold and windy once the sun has gone down. Today's trek will take around 6 hours and involves approximately 1,250-1,390m/4,101- 4,561ft of ascent (depending on site of overnight camp). Day 4 - Trek to Azib Imi N’ouassif, 2,700m/8,858ft, via Lac D’ifni, 2,312m/7,585ft - 6-7hours. This morning it will only take around 15 minutes to reach the col, Tizi t'Ourai, 3,120m/10,236ft, above your camp from where you finally enter the southern side of the High Atlas. In clear weather there are fine views south over Jebel Sahro and the desert. Toubkal lies to the right and villages with their vibrant green terracing nestle in the valley below. It is 1,300m/4,265ft of descent, but the path stays on the crest of the ridge all the way affording great views throughout. The descent can be done in 2½ hours, but it is worth enjoying it. Tagounite is the first village you descend into and in June the roofs of the houses will be covered in swathes of grass laid out to dry. Women will be busy carrying bundles through the fields and the men will be out ploughing the fields. You may be offered walnuts or find bags of cherries for sale. You will find yourselves on a track leading into Amsouzerte where the ability to get fruit out to market has brought relative wealth to the valley. The houses in Amsouzerte are substantial compared to the surrounding areas: often three or four storeys high with fine views. They are still basic however, with little more than carpets on the floors, a squat toilet and shower, and some electricity. There are basic stores in town and you will find fizzy drinks, fresh orange juice, and whatever fruit is in season. After lunch and a refreshing mint tea, you will trek gradually up and out of Amsouzerte to Lac d'Ifni. The first hour out of Amsouzerte is wonderful walking through busy villages up the Ait Tissili valley. The well graded track passes through Takatert, Tisgouane and finally Tirhaltine. Well-kept terraces are fed via water channels from the Lac d'Ifni hidden from view by what appears to be a dam of rocks. Poplars and willows thrive in this climate, as do the walnut and chestnut trees. Later in the season you can pick blackberries as you walk. Takatert is reached in just over an hour and there are several kiosks here that will sell you cold drinks in the shade of the nut trees. After this the path is in the open, and hot! There is a large track that zigzags up the face of the massive rock wall ahead. More interesting is to follow the little path up through the village of Imhiliene joining the zigzags higher up. The path up to the top of the rocks that have created the lake is longer than it looks and it is a good hour before the terrain begins to level off. There are paths up the left and right sides, but ultimately they join, as the path around the lake only follows the right bank. It is a strange sight, the turquoise blue lake glinting in the sunshine. Current thought is that it was created not by moraine, but by massive rockslides. On the gravel plains on the far side are a few small stone shacks which are reached in the best part of another hour. It is possible to camp by the lakeside, but better to head up into the gorges for a while to make the ascent tomorrow easier. Mouflon (wild mountain sheep) have been seen here in the past. Today you trek for 6-7 hours, with around 735m/2,411ft of ascent. Day 5 - Trek to Refuge Neltner, 3,207m / 10,522ft, via Tizi n’Ouanoumss, 3,664m/12,021ft - 4-5 hours. It is a strenuous climb to the Tizi n'Ouanoumss, 3,664m/12,021ft, but ultimately this is a short day reaching Neltner in time for lunch. From camp it is still almost 1,000m/3,210ft to the col, but the height is gained quickly over a short distance. The path keeps well to the right of the valley avoiding the deepest parts of the gorge and as such the lac remains out of view for most of the ascent until just before reaching the col. The top is reached in 2½ to 3 hours. There is a direct route on up the ridge to the summit of Toubkal from here, but it involves abseiling and is best left to the experts! The views from here are impressive: Up to the left at the head of the valley is Jebel Ouanakrim, 4,088m/13,413ft, and the second highest peak in the Atlas. Directly opposite is the ridge of the Clochetons with the prominent pinnacle of Tadat, 3,755m/12,320ft, in the middle. The descent from the col down into the upper Mizane Valley is short and steep, but on a well built zigzag path. It takes about half an hour down to reach the valley bottom and then another half an hour along the valley floor to the Neltner Mountain Refuge, 3,207m/10,522ft. A second refuge has been built here in recent years alongside the original French Alpine Club hut. This brings capacity in the huts alone to well over 200 people and the place always seems busy. There is also a new building for muleteers and even for their mules downstairs for when it gets cold. We choose to camp on the terraces in front of the new hut. This allows you to enjoy the privacy of your tents (rather than large dormitories). Depending upon how busy the refuge is you may be able to take a shower or to use their toilets. The afternoon can be spent relaxing ahead of tomorrow's summit bid. Today you trek for 4-5 hours and ascend approximately 1,350m/4,429ft. Day 6 - Ascent of Jebel Toubkal, 4,167m/13,671ft - 4-5 hours. Your goal today is the ascent of Jebel Toubkal, 4,167m/13,671ft, the highest mountain in North Africa. It is traditional to make an early start before 7am, not just to avoid ascending in the heat of the day, but also because clouds tend to build up around the mountain after midday, frequently obscuring the views. The route up via the south cwm is the normal route and is predominantly scree and boulder although they are reasonably firm underfoot. The route reaches a col, the Tizi n'Toubkal, 3,940m/12,927ft, in just over 2 hours from where there are fine views south, and continues up just below the ridge summiting normally in just over 3 hours. The most notable feature of the summit is a large iron pyramidal structure. The views extend well south towards Jebel Sahro and Siroua and whilst in mid-summer they are usually restricted by heat haze, the spring and autumn are generally much clearer with cloud inversions common in September and October. The mountain can be descended in a couple of hours, returning the way you ascended. However, unlike many other groups on the mountain we have time to make a far more satisfying traverse of the mountain, descending via the north cwm. This is a much quieter route and passes the satellite peak of Tibherine, 4,010m/13,157ft, on which still lie the scattered remains of a light aircraft that crashed back in the 1970s. Owing to the early start, lunch will be back at camp followed by an afternoon relaxing. There will be a shower available for you to use. Depending upon the route of descent you will be trekking for between 4 and 5 hours today, with an ascent of 960m/3,150ft. Day 7 - Trek from Refuge to Imlil, 1,750m /5,741ft - 5-6 Hours. Drive to Marrakesh. Your last day on trek now leads you down from the high peaks. From the refuge you follow the track used by the overwhelming majority of trekkers to reach the foot of Toubkal. At various points along the way you come across stalls selling Berber tea, cold drinks and souvenirs. This is especially true around Sidi Chamharouch where a large white-painted boulder marks the burial plot of a local saint. The descent to the road-head at Imlil takes around 5-6 hours. Lunch will be taken during the trek. Transport will await you in Imlil, from where you make the short 1-1½ hour drive back to Marrakesh. After freshening up at your Riad/Hotel you can take a stroll around the Medina before dinner. As the evening draws in, the Djemma el Fna - an enormous open area at the edge of the souks - begins to fill with open air food stalls, story tellers, snake charmers and dancers. This nightly ritual of exotic sounds and smells draws locals and tourists alike. Take a wander through the crowds or enjoy people watching from one of the cafes overlooking the scene. Day 8 - Group transfer to airport. Fly to London. Depending on your flight times, you may have time to yourself to explore one of North Africa's most fascinating cities. Points of interest within easy reach of the medina include Les Jardins Majorelle - Yves St Lauren's celebrated gardens, the Saadian Tombs, the Tanneries and the Badii Palace. The medieval-style alleyways and squares of the old medina (walled city) immediately transport you to a different age. Across the main Djemma el Fna square lies Marrakesh's famous souk, filled with traders offering wood carvings, metalwork, clothing, carpets, and a myriad of other goods aimed at both locals and visitors. Although the souk is the place for souvenir and gift shopping, if you have not already experienced in the art of haggling a visit to one of the city's 'fixed price' shops can be a good first step: as this will give you a rough guide as to the prices to expect to pay for the various tempting arts and crafts. The transfer time to Marrakesh airport is between 20 and 30 minutes depending on traffic, but you will be transferred from your Riad in good time to check-in for your flight to London. For a complete change of scene from the frenetic activity of Marrakesh, or after a tough mountain trek, the coastal town of Essaouia is a delightful place to relax. Its whitewashed buildings and city walls add to its calm ambience and a stroll along the ramparts or beach at sundown is an excellent way to unwind.